Honest review of the Betfair Arcade website. The Betfair Arcade. What's it like? Betfair is a very clean, well-presented games website. It’s sleek and professional with many good games (with a few gems missing), all organised nicely via the sidebar navigation. But if it’s all so good, why isn’t it the top real money games website? Because it’s just no Paddy Power Games. The Betfair Arcade is honestly really good, but that’s the problem - it’s just "good". Paddy Power Games just goes one better across the board. Paddy Power has more games, better games, a better design and I prefer the banking and support there too. You can’t go wrong at all with the Betfair Arcade, it’s just that you can go more right with Paddy Power Games. Review of the games on offer. The Betfair Arcade most of the most popular games, but not all. They’re lacking the likes of quiz games like Bullseye for example, which is like running an ice cream shop but not selling a 99 with a flake. They also do not currently offer any games that are unique to Betfair, although they have renamed a few of their games to make it appear as though they have a few unique’s. Don’t be fooled, these are just the same shared games with different names. The overall standard of the games is above average. This is most likely due to the fact that the Betfair Arcade hosts fewer games than most, which suggests that there could be some form of quality control in place. I still can’t forgive them for not having Bullseye though sorry. The Betfair Arcade commits the sin of lumping slots in to the games section (which I’m not a fan of), but there isn’t an overwhelming amount so it’s not all that bad. The Betfair Arcade design is really sleek. The white background makes everything look rather clean, and this "clean" look helps when it comes to scanning through all of the games on offer. Overall Betfair have done a great job on the design of their arcade. A nice touch at the Betfair Arcade is the daily play count for each of the games. Using this play count you can gauge how popular the games are. Some real money games sites offer lists of the most popular games, but Betfair is one of few that actually shows an individual play count for each game. The sidebar navigation for sorting the games also works really well. There aren’t as many categories as most games sites, but it does a decent job. 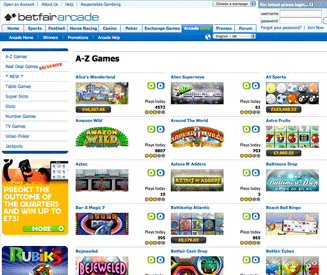 Betfair Arcade is part of the large Betfair website (as I’m sure you might have already guessed). Betfair have been processing transactions for years and so their banking system is very reliable. All of the most popular deposit options are available for you to take advantage of at Betfair. Basically it’s what you should have already come to expect from a solid online gambling games website. Withdrawal methods are exactly the same are deposit methods - they’re all there. Debit and credit card withdrawals can be processed in as little as 2 working days if you’re lucky, which is nice. The typical withdrawal time though for cards is 2 to 5 working days. Betfair support is good. I wouldn’t say that they were quite as friendly as the support at Paddy Power Games on the whole, but they certainly were not rude in any way. All in all though they get the job done, which is the main thing. Betfair have specific email and phone contacts for each area of the Betfair website, which helps to get any issues sorted out as quickly as possible. There is also the option of getting in touch via post, but there is currently no live chat option available at the site. The no loss bonus - £25. The Betfair Arcade £25 bonus is a little different to most, as it is a no-loss bonus as opposed to a straight up free £25 bonus. This basically means that instead of having £25 credited to your account for you to play games with, you instead have a £25 allowance where you will be refunded up to £25 if you end up losing money on your first day. Not a bad bonus all in all. It’s nice to know that you have a £25 safety net there just in case, so you can go ahead and give the a games a really good test run.